Streaming site Vimeo makes space for lots of different kinds of content. They've made a name for themselves as a cooler alternative to YouTube and you'll find cool mini-documentaries, visionary music videos and intensely personal narratives. However, one thing that has become increasingly difficult to find has been anything related to video games. Specifically, indie video games. Vimeo's long been the go-to space for heralded indie titles like Sword and Sworcery to tease viewers with glimpses of in-development games. Yet, indie devlopers are finding themselves running afoul of an edict that forbids video of gameplays for users at the Basic and Plus levels of membership. 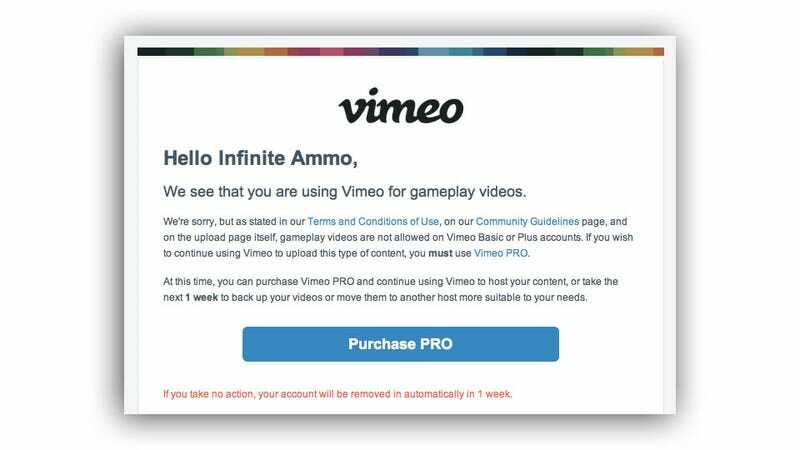 To have gameplay videos hosted, users must purchase the Pro level at a cost of $199/year. That may not seem like a lot, but considering how many indie games get made by one- or two-person teams with no other source of income, it can be a big difference. So, there's a number of very maddening things about Vimeo's policy. At a very basic, basic level, it's a deliberate and prejudicial exclusion of an entire mode of creative and artistic expression that apparently doesn't fit their very, very outmoded approach to culture. (B-but—they all look so young & hip & "positive & encouraging"!) This policy denies that branch of culture access to the supportive community of users who don't at all share their prejudices. Beyond that, though, it's just the simple capriciousness and inconsistency of how they deign what's acceptable and what's not, either by ignorance or by choice. I obviously don't want to list out by name the number of indie game developers that they've apparently overlooked or chosen to ignore because it doesn't, what, feel as videogame-y as the rest? But, by taking a quick stroll through their staff picks, you can spot just how ridiculous their singling-out is. If your content wants to take your aesthetic cues from game culture? Totally ok, so long as it's not interactive or is cut to music, even if it's a blatant IP violation. However, using the service to showcase the interactive work in games that you yourself have done will never be as valuable an asset to their creative community as taking a bunch of photos of yourself in PhotoBooth and putting them together in iMovie, set to someone else's music or training a camera on a lip-syncing child because— well, apparently, just because video games. and you won't find any complaints of people getting singled out for deletion. What exactly is the difference? That one has a goal? If 404's Kinect work set up an AR basketball hoop that let you real-time track a virtual ball and kept a running scoreboard, well, that's video games, right? That should surely be deleted? But also: they have been known to reverse their policies when you complain loudly enough. You can have your account flagged so that your gameplay videos will no longer be removed by any new or overzealous admins, but in the meantime, if you're people like Krystian Majewski or Alec Holowka, the only way you can continue to have access to their community is to pay them $199 a year. So let's just state that again more clearly. If you are an artist of any stripe: if you dance, sing, draw, paint, cook, write, film, knit, even create motion graphics, generative art, creative code with the same exact digital tools used to make games — audiovisual representation of your work is welcome on vimeo.com at absolutely no charge. If, and only if, you extend that art a step further into something goal-oriented, digital art, or play, or however they shallowly and narrowly define "video games", you are the only artists stopped at the gates and instead get shaken down for two hundred dollars a year to join their club, and even then that community still has no access to your content without their case-by-case approval. That should not be OK with anyone involved in creative culture on any level. Brandon Boyer is the chairman of the Independent Games Festival. He's also preparing to launch Venus Patrol, a web destination dedicated to the search for beauty in the video game medium.